A second page was needed because the first was becoming rather long: this carries on in the same manner, and also includes details of many collectable items of Alfred the Great. 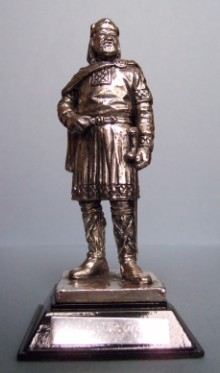 A fine statuette of Alfred the Great, in pewter, measuring four and three quarter inches in height, including base: manufactured by the now defunct Royal Hampshire Art Foundry, of Alton, Hampshire. Between 1996 and 1997 Royal Doulton produced a limited edition figurine of Alfred the Great, as part of the Men of History series. Designed by Douglas V. Toole, it measured in height nine and one quarter inches. In 1995 Royal Doulton issued a plate showing Alfred the Great repelling a Viking invasion; it was part of a series of Kings and Queens of the Realm, and was limited to 3,500 copies. The artwork was by Jose Miralles. A medal, plated in 22ct Gold, depicting King Alfred; the reverse shows the arms of the City of Winchester. Minted during the 1990s. Because of the highly polished surface it was not possible to photograph without some refection. In 2003 Alderney, in the Channel Islands, issued a Five Pound Silver Crown celebrating Alfred the Great as the founder of the Royal Navy. Sculpted by Raphael David Maklouf. 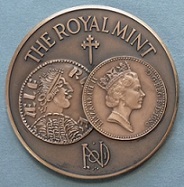 In 1986 the Royal Mint issued a medallion to commemorate the Royal Mint's 1,100 years of minting: one side features the royal arms, the other side bears portraits of Alfred the Great , taken from a London penny, and the Queen, taken from a 1986 penny. It was limited to 1,100 issues. In 1991 the Danbury mint issued a 70 medal collection entitled Our Royal Sovereigns, to commemorate 1,200 years since the first Coronation. Silver, with 24 carat gold plating. One of these featured Alfred the Great; on the reverse is the coat of arms attributed to him. The Britannia Commemorative Society, formed in 1965 by Joseph Segel, issued silver medallions to its members at the rate of one per month, in conjunction with the Franklin Mint, which he also formed. The first series featured great or important events or people in the history and development of the United Kingdom. Number nineteen in the series (1970) was Alfred the Great, Patron of culture and the church, sculpted by Avangelos Frudakis. 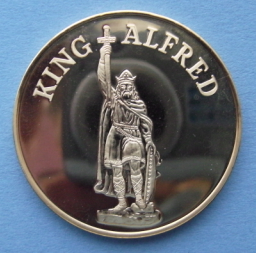 In 1996 the Falkland Island issued a silver £2 coin depicting Alfred the Great, as part of their Royal Heritage Series; the image, which is of the King Alfred statue at Wantage, was engraved by Raphael David Maklouf. In 2004 the East Caribbean States issued a $2 coin plated in 24ct gold showing Alfred the Great; it was part of a series of Great British Military Leaders. 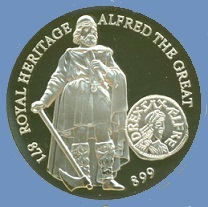 A Crown Piece issued in Gibraltar in 1999, showing Alfred the Great; sculpted by Raphael David Maklouf. 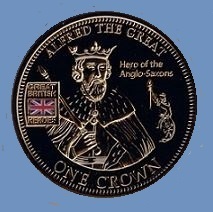 In 2010, Tristan da Cunha issued a Crown piece showing Alfred the Great - Hero of the Anglo Saxons, as part of a set of Great British Heroes. Richard Charles Jackson's design for a medal to commemorate the Millenary of King Alfred the Great; the drawing was made by the artist Ernest Cousins. It is not known if the medal went into production. 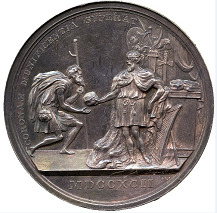 A silver medal issued in 1792 by William Barnett, showing King Alfred dividing his last loaf with the beggar, who was later revealed to be St.Cuthbert. This incident happened while Alfred was hiding out in the marshes on the Isle of Athelney. A silver medal issued circa 1935 by the Militia Rifle Association for marksmanship, the reverse shows King Alfred, who first settled a national militia. A medal of unknown date and origin, referring to Alfred and the burning of the cakes. A medal issued in 1886 to commemorate the Millenary of the first Royal charter granted to Ripon by King Alfred. The Osborne Ivorex Factory, started in Faversham, Kent in 1899, It produced over 450 wall plaques, made from Plaster of Paris, painted, then covered in a wax seal to give it an ivorine appearance. One of their plaques was of Alfred the Great (portrait); another showed the famous scene of Alfred burning the cakes (above). Declining sales caused the factory to close in 1965. In the earlier part of the 20th century, Arcadian China of Stoke-on-Trent produced a porcelain model of the Alfred the Great statue at Winchester. Label from a box of King Alfred Cigars, manufactured in the U.S.A. in the early part of the 20th Century. These clocks were sent to stores to advertise King Alfred Cigars; the one on the left incorporates a cigar cutter. In the early 1900s, the King Insurance Company of London, issued a set of about 48 postcard sized cards featuring Kings of Britain. In 1902 tobacco manufacturers W.D. & H.O. Wills issued a set of 50 cigarette cards of Kings & Queens, one of these cards featured Alfred the Great. In 1902 Taddy's Cigarettes issued The Coronation Series; the 1st card in the series was Alfred the Great. In 1909 Player's Cigarettes issued a set of 50 cards entitled 'Arms and Armour'; one of these featured King Alfred. In 1911 tobacco manufacturers W.D.& H.O.Wills issued a set of 50 cigarette cards named 'The Coronation' series. the first card in the series was 'The Election of Alfred the Great. In 1913 Smith's Cigarettes issued a set entitled 'Battlefields of Great Britain', No 1 in the series was 'The Battle of Ashdown', and shows the statue of King Alfred at Wantage, The White Horse of Uffington, King Alfred's Jewell, and King Alfred. In 1915 W.D. & H.O. Wills issued a set of 25 cards entitled 'The Evolution of the British Navy', No 1 in the series was Alfred the Great. 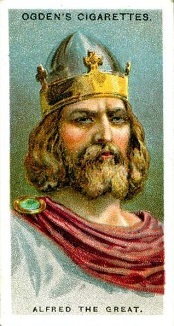 In 1924 Ogden Cigarettes issued a set of 50 cards entitled "Leaders of Men", No 2 in the series was Alfred the Great. In 1924 Godfrey Phillips issued a set of 25 cards titled 'Famous Boys', No 23 in the series was Alfred the Great. In 1925 Chairman Cigarettes (R.J. Lea Ltd of Stockport), issued a set of cards entitled 'The Evolution of the Royal Navy', No 2 in the series was Alfred the Great. In 1929 Pattreiouex Cigarettes of Manchester issued a set of cards entitled 'Builders of the British Empire', No 1 in the series was Alfred the Great "Father of the British Navy". In 1934 Churchmans Cigarettes issued a set of 50 cards entitled 'The Story of London', No 7 in the series was 'Alfred the Great rebuilding the walls of London, 886'. In 1937 tobacco manufacturers Churchmans issued a set of 40 cigarette cards, of cartoons, entitled 'Howlers'; one of these depicted Alfred the Great burning the cakes. In 1938 the Typhoo Tea Company issued a set of 25 cards entitled 'Interesting Events in British History'; number 5 in the series was Alfred the Great. 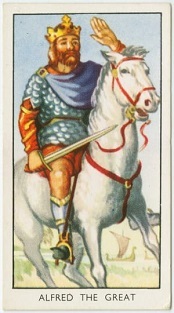 In 1952 the Stamina Clothes Company of Australia issued a series of cards entitled 'Men of Stamina'; the 5th in the series was Alfred the Great. In 1954 Mills Cigarettes (Amalgamated Tobacco Corporation) issued a series of cards 'Kings of England'; the first card in the series was Alfred the Great. In 1957 Mills Cigarettes issued a set of 25 cards entitled 'Evolution of the Royal Navy, No 1 in the series was At the time of Alfred the great. 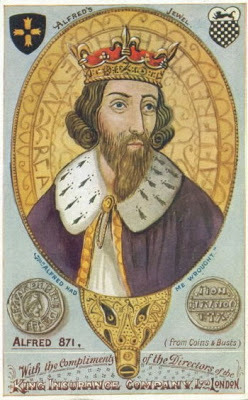 In 1957 Kane Cigarettes issued a set of 50 cards entitled 'Historical Characters'; number 43 in the series was Alfred the Great. In 1958 Mills Cigarettes issued a set of 25 cards entitled 'British Coins and Costumes', No 5 in the series was Silver Coin of Alfred the Great. In 1961 Domino Gigarettes, owned by the British American Tobacco Company, issued a set of 25 cards in Morocco, named "Figures Historiques" (Historical Figures); number 23 in the series was Alfred the Great. In 1981 tobacco manufacturers John Player and Sons, produced a set of 32 cards named 'Myths & Legends"; the cards were given with Tom Thumb cigars. 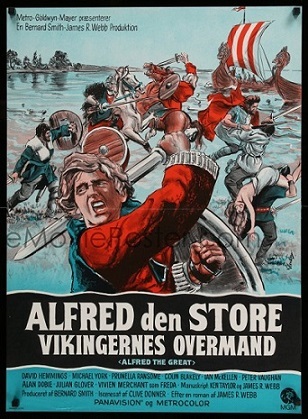 One of the cards featured Alfred the Great. An antique mineral-water bottle featuring the statue of Alfred the Great at Wantage; Clegg and Son were, and still are, Chemists trading in Wantage. They used to sell mineral water. This is a rare bottle as the majority did not feature the statue. A beer/mineral water bottle produced for Aylward and Sons, of Winchester and Southampton. Aylward's were Beer, Wine and Spirit Merchants. They were in business from at least 1896, and appeared to have ceased trading around 1955. Antique brass door-knockers of the Alfred the Great statue at Winchester. 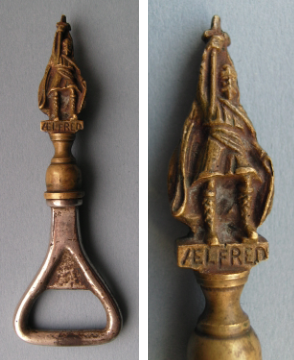 A vintage bottle-opener with a replica of Winchester's statue of Alfred the Great, in brass. A brass toasting-fork manufactured by the now defunct company Peerage, featuring Hamo Thorneycroft's famous statue of Alfred the Great at Winchester. (The shadow gives the impression of the handle being bent). Two magic-lantern slides manufactured by George Washington Wilson (1823-1893). The slide on the left is titled 'Alfred the Great and his Mother", the slide on the right is titled 'Alfred before Pope Leo'. George Washington Wilson's stock of 40,000 glass plate negatives was auctioned off in 1908. The collection changed hands several times before being offered to the University of Aberdeen in 1954, where they remain. The photographs do not do justice to the fine detail of the pictures. An Argentinian poster for the 1969 M.G.M. 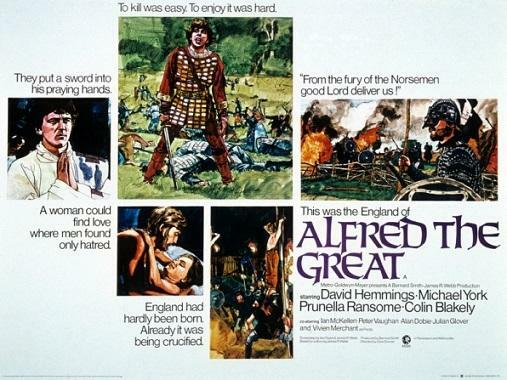 film 'Alfred the Great' , starring David Hemmings and Michael York. 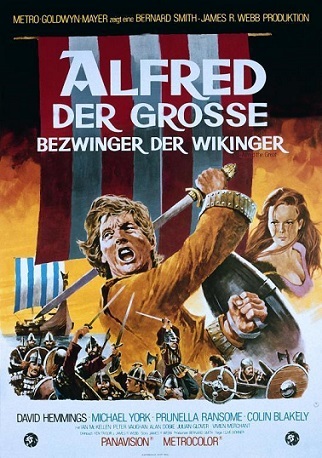 A Belgian poster for the 1969 M.G.M. film. 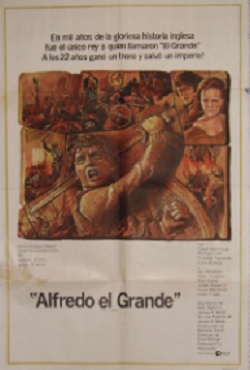 A Spanish poster for the 1969 M.G.M. film. First official DVD release of this film, 16th August, 2016. A house in Stourhead, Wiltshire, has a brass door-knocker of the folly Alfred's Tower; the knocker is believed to date from about 1910. In the 1970s a Wantage jeweller commissioned a limited edition silver charm of their statue of Alfred the Great: they originally sold at nine pounds each. There have been several reproductions of the Alfred Jewel; the original is in the Ashmolean Museum, Oxford. Publisher Elliot Stock commissioned a replica around 1899-1900; Payne & Son, Jewellers, High Street, Oxford, commissioned a replica in 1901; W.H.Young, a restorer at the Ashmolean made electrotype replicas for the Ashmolean around 1909. There was another replica available in the 1970s (manufacturer not known), these were sold for a very short time at the Past Times chain of gift shops, and the Ashmolean Museum gift shop, retailing at forty pounds. 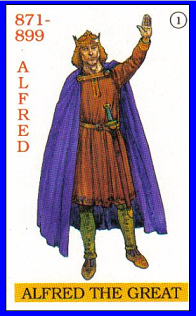 Alfred the Great, from 'The Famous Monarchs of England Card Game' issued by Heritage Toy and Game Company in 1993. The King Alfred Indoor Bowls Club, based at the King Alfred Leisure Centre, Hove, Sussex. Left, an early badge in metal and enamel, with a good raised impression of King Alfred; right, a later issue in plastic, with a cartoon style representation of Alfred. A Victorian or Edwardian ceramic night light holder; I presume there was also a brand of King Alfred Night Lights. I have been unable to find any details about the manufacturer. One chronicler wrote 'In the year of our Lord's incarnation 849, light rose out of darkness, Alfred, King of the English was born'. To later historians King Alfred has appeared as a lonely light shining in the midst of an impenetrable darkness. Between 1920 & 1970, the company of G.J. Hayter, of Boscombe, Bournemouth, manufactured plywood jigsaw puzzles: one of these, entitled Alfred the Great, containing 500 pieces, and measuring 19" X 15", appeared to show the defeated Viking leader Guthrum and his followers, being shown what areas of England they were to be given control over (Danelaw). In 1970 the company was taken over by Spears Games. In 1845 G.E.Petter of London issued a series of miniature books measuring two inches by one and a quarter inches, and containing around 128 pages. The series was named "Diamond Lives": among them was "The Life of Christ", "The Life of Joseph", "The Life of Abraham", "The Life of Samuel". 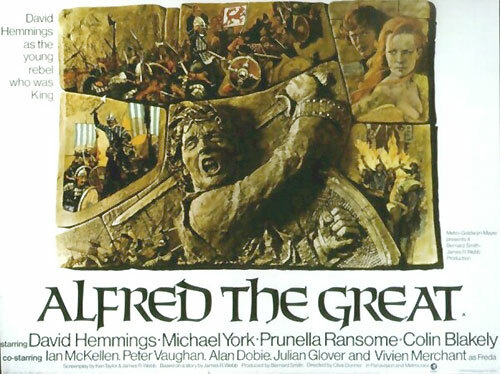 The 6th in the series was "The Life of Alfred the Great". The above coin is known as an 'Evasion Piece" and was minted during the late 18th century; the reverse shows a seated Britannia, and the words 'Britains Glory'. [my thanks to Barry Woodside for the picture and information]. This is part of a series known as 'Irish Tokens', one token showing an uncrowned Alfred, has on the reverse 'South Wales' and the Irish Harp. There are three other known Alfred types, the reverse reads: (1) Music...Charms (2) Unity and Peace) (3) Sheebernia. Most of these 'Irish Tokens' were manufactured in Birmingham. A less than regal looking Alfred the Great featured on this Evasion Piece, issued in the 1790s. (see above for more details). 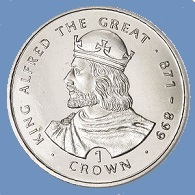 The image of Alfred the Great is identical to that which reads 'South Wales' on the reverse. I have not as yet seen the remaing two Alfred tokens to be able to state whether these are identical. A Half-penny token issued in the 1790s by Payne & Turner, Silversmiths, Bath, Somerset. It reads "ALFRED YE GREAT REFOUNDED BATH AD 900", on the reverse it features a castle, and reads "AND SURROUNDED IT WITH WALLS AND TOWERS"
In 1811 a small number of traders in Frome, Somerset, issued a silver shilling (12 pennies) in order to ease the shortage of small change in the area. One side features a front facing portrait of King Alfred, and the obverse lists the names of the traders who issued the coin. R. Dalton, in his book 'Silver Token Coinage issued mainly between 1811 & 1812', published by B.A. 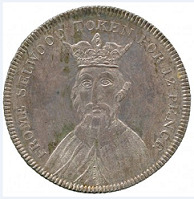 Seaby, London, in 1922, records that in 1812 a silver token with a value of 40 shillings (two pounds), was issued in Reading, Berkshire; it featured a bust of Alfred the Great. 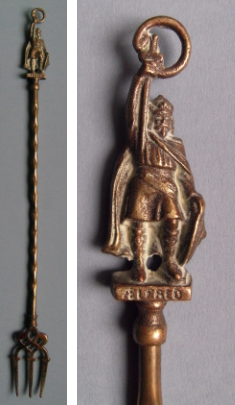 A spoon featuring the statue of King Alfred at Winchester; manufactured by the Tower Mint: also in the same series is a jam spoon and a paper knife (letter opener). In 1978 when the Somerset village of Wedmore was celebrating the eleven hundredth anniversary of the signing of the Treaty of Wedmore in 878, an unknown manufacturer produced a commemorative mug. On the front is a very poorly drawn representation of Alfred the Great; the reverse reads '878 AD. At Wedmore Alfred the Great made peace with Guthrum the Dane. Commemorated 1978'. Victoria China produced a set of 20 thimbles 'History of Britain', commemorating 20 historical events: number 5 in the series was Alfred the Great's victory over the Danes in 878 AD. This bust of Alfred the Great, believed to have been manufactured in the 1970s, was given to customers who purchased Cleveland Petrol. There were about 20 English Monarchs in the series. The Cleveland Petrol Company, famous for their Discol and Super Discol brands, produced a number of collectables in the 1970s; Busts of football players, football cards, and reproduction campaign medals. This representation of Alfred the Great looks more like the Beatles during their Sgt Pepper period. The only regal looking part is the cloak fastened by the large brooch. Height is 50mm. A 19th Century Spelter figurine of King Alfred, measuring 16 inches in height. It was brought out for the King Alfred Millenary. There are several variations; the figure on the right is gilded, and the axe fixes to the belt in a different position. Artist unknown. A late Victorian Spelter figure of King Alfred. 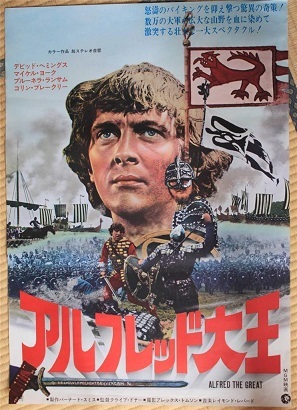 In 1953 Encyclopaedia Britannica Films issued a 35mm filmstrip of captioned drawings, telling the life of King Alfred. A framed plaque of Alfred the Great, titled ALFRED YE GREATE, made in two parts, it measures twenty seven inches by sixten and a half; it was manufactured in 1900 by the Della Robbie Pottery, Birkenhead , Liverpool; from a design by Ford Madox Brown (1821-1893). A 16th Century, or earlier, carved oak panel showing Alfred the Great. It measures 19 and a half inches by 4 and three quarter inches. Alfred has been depicted in the costume of the day, rather than of the period he lived in. Original location of this panel unknown. 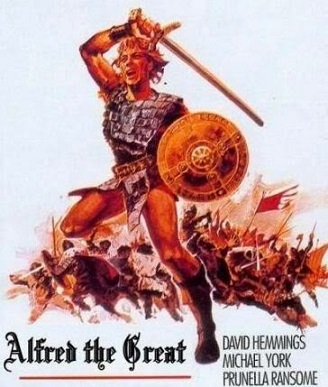 'Alfred the Great: Warrior and Peacemaker'. V.H.S. tape produced by Castle Home Video in 1994. Running time: 55 minutes approx. The Alfred Press, established in Wantage in 1875 by the Nichols family was one of the first to use the statue as a trademark. The company ceased trading sometime after World War Two. The flour mill in Mill Street , Wantage was originally owned by the Clark family, and used the statue of King Alfred as their trademark, and supplied among others Huntley and Palmers biscuits. The mill is now owned by the Munsey family, and the trade mark is still in use on some of their flours. 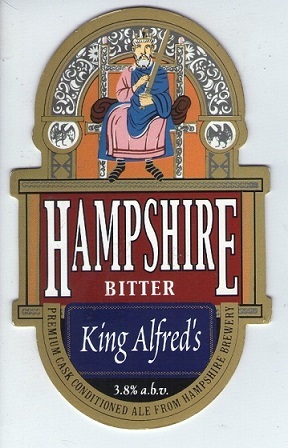 King Alfred's Bitter was brewed by the Hampshire Brewery at Romsey; they ceased trading in November 2008. King Alfred's Cake is the name of a Porter, brought out in 2016, by the Old Chimneys Brewery at Diss, Norfolk. Models of Thorneycroft's statue of Alfred the Great in solid Silver, made by F.J. Ross and Sons; the model on the left was made in 1910, the model on the right was made in 1929. King Alfred invented the Candle Clock; these replicas were made by Price's Candles. They are no longer in production. Maquette of Hamo Thorneycroft's statue of Alfred the Great; made of plaster and painted.